NYC, 02/07/2019, 6:30PM. 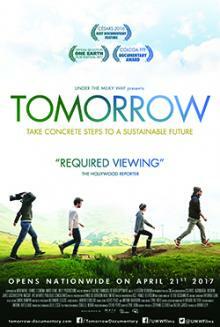 Tomorrow (2015): Saving the Earth for Our Children. As mankind is threatened by the collapse of the ecosystems, Cyril, Mélanie, Alexandre, Laurent, Raphäel and Antoine, all in their thirties, explore the world in search of solutions that can save their children, and with them, future generations. Using the most successful experiments in every area (agriculture, energy, habitat, economy, education, democracy…) they try to put back together the puzzle which may tell a new story of the future. Directed by Olivier Dion and Mélanie Laurent.